The Internet of Things (IoT) is the network of connected physical objects, such as vehicles, buildings and people. These objects, or "things," are often embedded with electronics to include sensors, actuators and microcontrollers that enable the devices to sense the environment around them, log data in real time, communicate with services or other devices, and be remotely controlled. 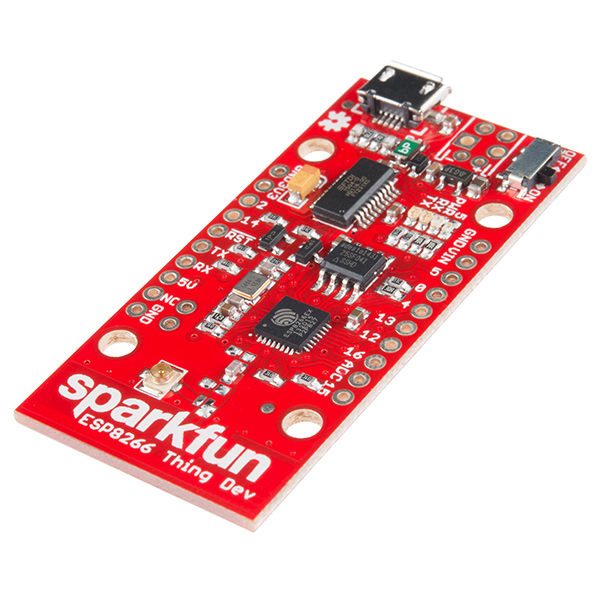 The SparkFun ESP8266 Thing Dev Board is a microcontroller board with a built-in WiFi radio, which makes it a fantastic development platform for IoT and home automation projects. Lucky for us, we can use the Arduino IDE to program the Thing Dev Board, which makes life easy for programming and configuring our IoT projects. This guide will show you how to set up your Thing Dev Board and construct a few simple (but useful!) connected projects involving logging sensor data and controlling home appliances. Note: Please be aware that this tutorial uses 3rd party web services. The web site layout, service names, and/or services provided by these vendors may change over time. Unfortunately, we are not responsible for any of those changes and you may need to do some research online to work around the changes. Note: Previously, this tutorial used the PowerSwitch Tail II. It has been updated to use the IoT Power Relay.